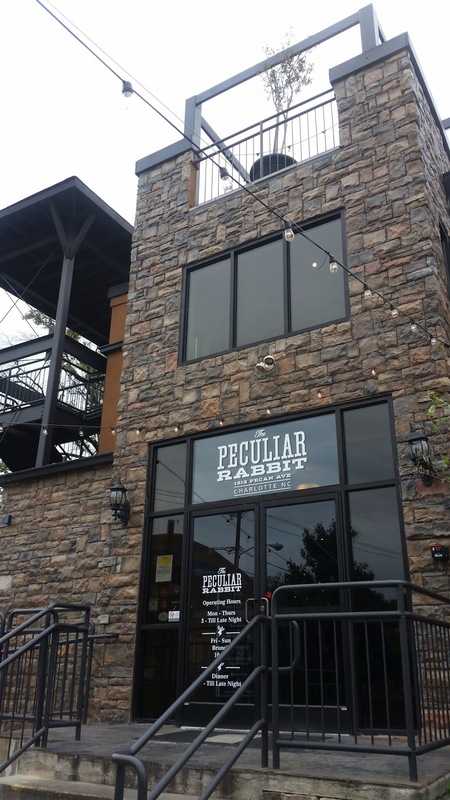 This week’s Exciting about Eating journeys to the Peculiar Rabbit, a farm-to-fork gastropub in the Plaza Midwood neighborhood of Charlotte. 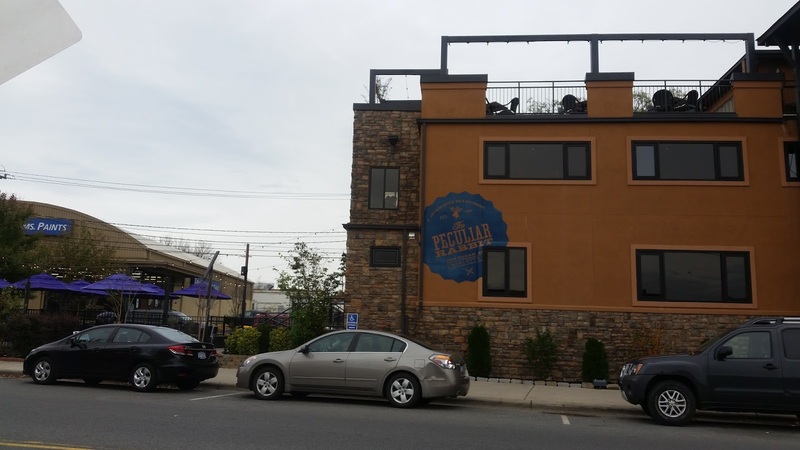 This neighborhood pub attempts to make everyone feel at home with their comfortable interior and friendly service. Dora here. Oops. Forgot to snap a picture of that comfortable, inviting interior. 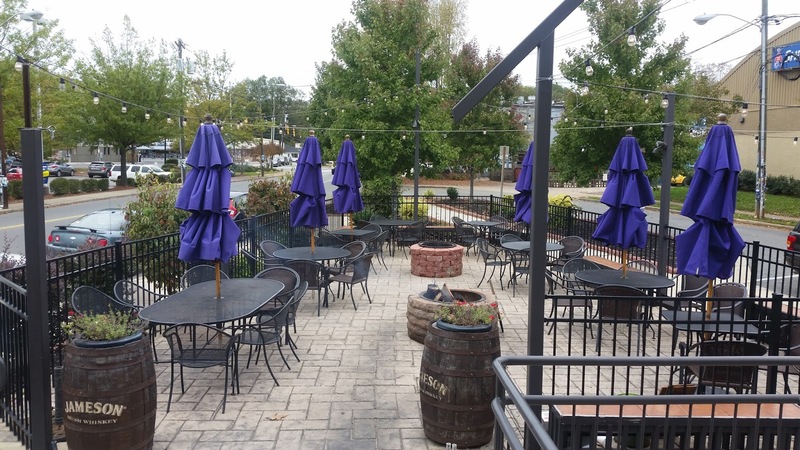 I was so impressed with all the beautiful exterior seating. 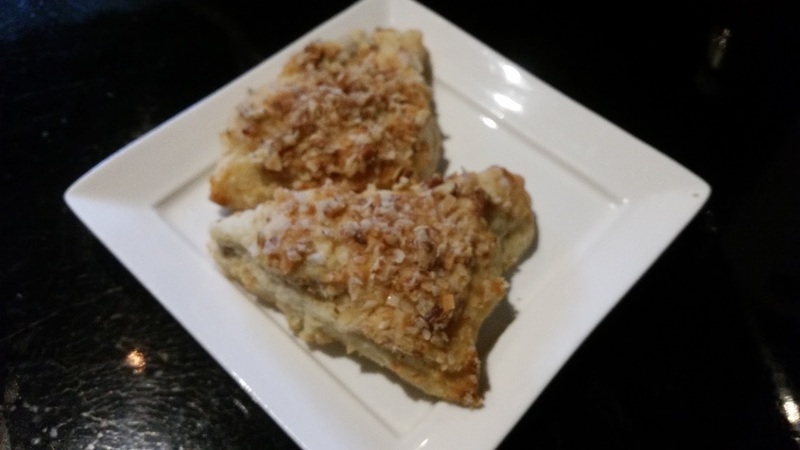 While we waited for our appetizer, the server dropped off complimentary scones. Fresh out of the oven hot, the coconut pineapple pecan scones melted in my mouth although I couldn’t really taste the pineapple. Dora here. I’d go back just for the scones! Soft, light and delicious! 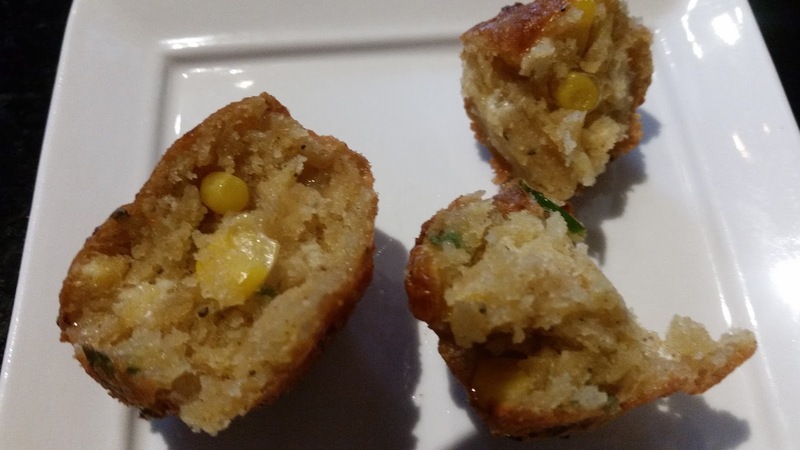 The Mexican Street Corn Fritters may be some of the best I’ve ever eaten! Roasted corn on the inside, good texture and golden brown on the outside. 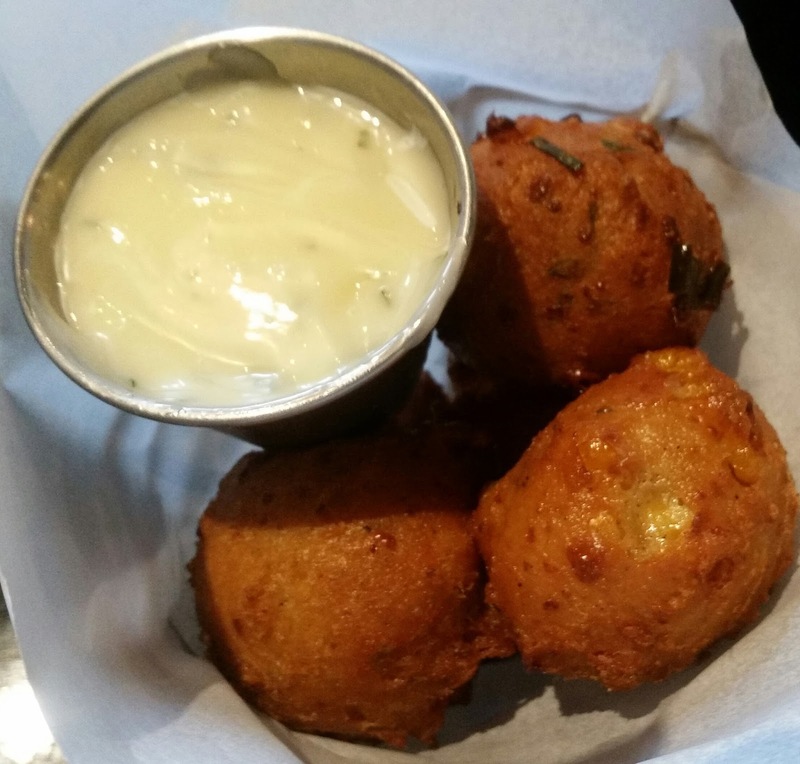 The honey-lime cilantro aioli paired perfectly with the fritters. Dora here. Such a wonderful blend of textures with the crisp outside and soft inside, and loaded with corn. Loved, loved, loved the lime aioli. The Chicken and Waffles dish was huge! 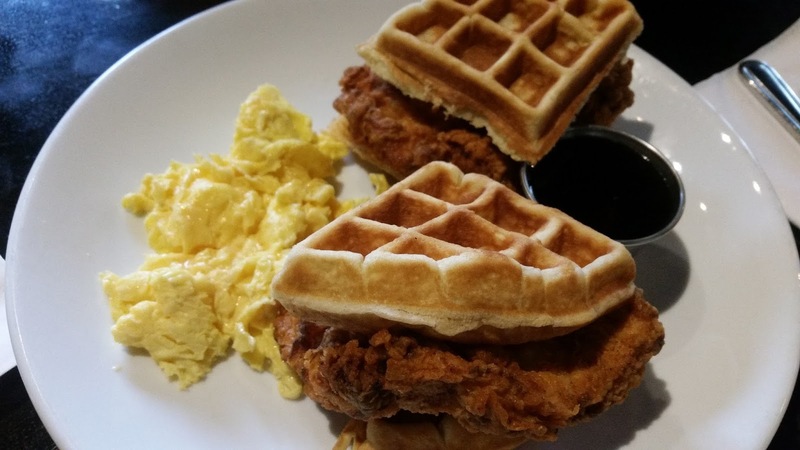 Chicken battered in 12 Herbs and Spices, malted milk waffles, Vermont maple syrup and two soft scrambled eggs. 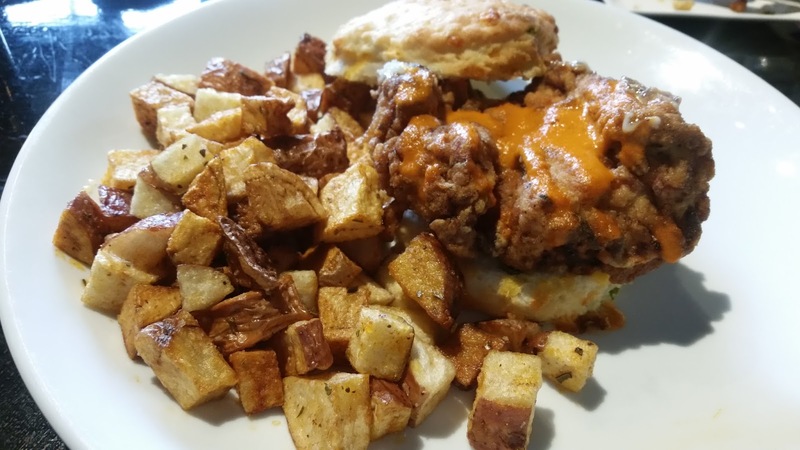 The eggs and waffle took a back seat to the fried chicken. Crispy, tender and moist. Outstanding! What about you? Given a choice, do you prefer to sit inside or out? Oh, those fritters look delicious! I prefer outdoor dining, if the temperature is toasty. They were, Jill. We ordered the fritters before we knew about the complimentary scones. But I'm glad. Oh my, delish! And so much food! Every picture of the food looks yummy! I really prefer to eat inside, avoiding the weather, flies, and mosquitoes we have here in Texas. Jill, they were great and we really wished we could have sat outside. Thanks Nikki, this time of year we really do not have bug problems here in North Carolina but I think I could work through the bugs to enjoy this outside setting.